Tomato-planting season is almost here! 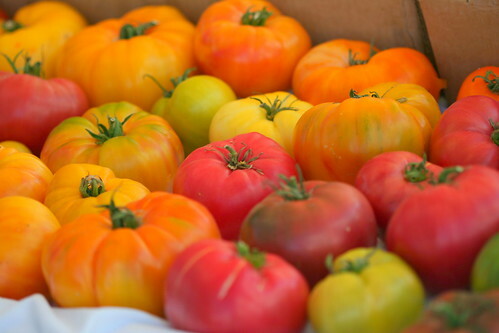 The folks at Feed will be selling heirloom tomato starts for your garden on the next two Sundays, May 8 and 15, from 2-4 p.m. (rain or shine) at the corner of 19th Ave. S. and S. Lander. Starts are $3 per quart pot. Please bring your own box to carry them home. On May 8, varieties for sale include Red Brandywine, Stupice, and Black Sea Man. On May 15, the available varieties will include Japanese Trifele, Limmony, Taxi, Tigerella, Aunt Ruby’s German Green, Plum Lemon, Reisentraube, Juliet Grape, Paul Robeson, Gold Medal, and Red Oxheart. You can see more about these varieties on the Feed website. Heirloom tomatoes. Photo by John Morgan, via Creative Commons. Greetings ! Last Sunday we sold out of the starts we had, and hung out a sign saying so after everything was gone. We had planned to finish off the rest in this coming Sunday’s sale …. but they’ve all been spoken for throughout the week via email requests and calls. We are very sorry if anyone was disappointed in not getting a start this year. This is the first year we’ve posted on the blog – and while the process is a little complicated for a small seasonal operation, we hope to be better organized next year; and also hope that this summer is a good one for tomatoes.